Publication: Trans. Linn. Soc. London, Bot. 1: 77, plate 2, fig. 2. 1791. Notes: Recognition of varieties in this species is based on minor fragrance and pubescence differences and inconstant lip dimensions, and remains controversial. Sheviak (2002a) provides a key to the varieties, and reports from Washington both var. pubescens and var. makasin, but the two have broad and almost completely overlapping ranges across the width of North America. The FNA treatment unfortunately provides the wrong maps for two of the three varieties recognized. "In the west it becomes very difficult to separate [var. makasin] from very small plants of var. pubescens that are common there," according to Sheviak (2002a). » Crib, P. J. 1997. The Genus Cypripedium. Portland. » Sheviak, C. J. 1993. Cypripedium parviflorum Salisb. var. makasin (Farwell) Sheviak. Am. Orchid Soc. Bull. 62:403. » Sheviak, C. J. 1994. Cypripedium parviflorum Salisb. I: The small-flowered varieties. Am. Orchid Soc. Bull. 63:664-669. » Sheviak, C. J. 1995. Cypripedium parviflorum Salisb. II: The larger-flowered plants and patterns of variation. Am. Orchid. Soc. Bull. 64:606-612 + cover 4. » Sheviak, C. J. 2002a. 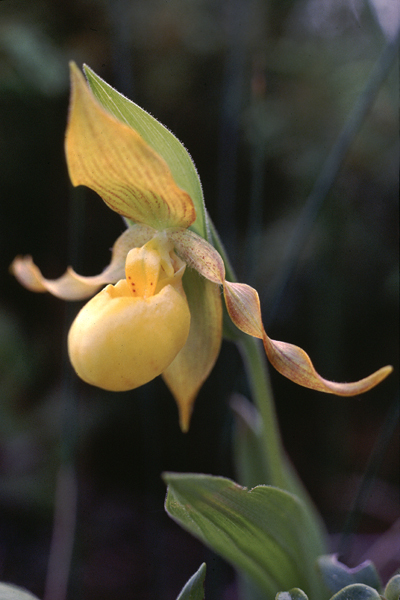 Cypripedium, pp. 499-507, In: Flora of North America Editorial Comittee, eds. 2002. Flora of North America North of Mexico, Volume 26, Magnoliophyta: Liliidae: Liliales and Orchidales. New York and Oxford. » Wallace, L. E. and M. A. Case. 2000. Contrasting allozyme diversity between northern and southern populations of Cypripedium parviflorum (Orchidaceae): implications for Pleistocene refugia and taxonomic boundaries. Systematic Botany 25: 281-296.